Wadjet Eye Games has carved out a solid reputation as a developer and publisher of retro-styled point-and-click adventure games like Gemini Rue, Primordia, Resonance, A Golden Wake, the Blackwell series, and a pile of others. Today it announced a new addition to that lineup: Technobabylon, a cyberpunk adventure due to come out this spring. The dystopian Technobabylon is set in the year 2087, and takes place in a city under the control of an omnipresent AI named Central, backed by the CEL police force. It will feature three playable characters, all about to "meet their maker": Charlie Regis, a CEL agent being blackmailed with the lives of his unborn children; Latha Sesame, an agoraphobe addicted to "the Trance," a sort of virtual drug that has all but replaced real-world interactions; and Max Lao, another officer, forced to choose between loyalty and the law. 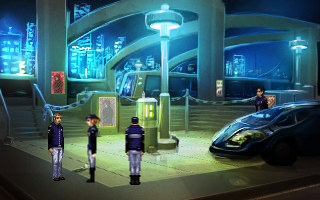 Technobabylon was actually begun by indie developer James Dearden as a planned eight-part freeware game, the first chapter of which was released in 2010. The commercial release will feature revamped story and gameplay, professional voice acting, and new pixel art by Ben Chandler, the lead artist on The Blackwell Epiphany. What makes Wadjet Eye's games especially interesting is that there's no guarantee of a happy ending. If you've played Resonance, you know what I'm talking about, but it's hardly alone in that regard, and I can see Technobabylon going down that same road. I'm no fan of ugliness and sorrow for the sake of it, but I do enjoy the uncertainty of games that are willing to let me fail in a meaningful way. There's no hard release date yet, but more info can be found at the Wadjet Eye Games website.